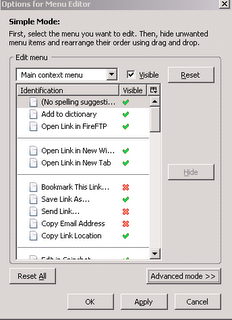 When you right click in your FireFox browser you can notice many options which you may not be using from the context menu, slowing the reaction time,as well affecting your productivity.To unclutter your context menu you can make use of the Menu Editor Firefox Extension, Using which you can rearrange or remove menu items from the context menu and also from the main menu bar. You will find this extension not in the context menu, but in the Add-ons Menu under Tools in the Firefox Menu bar.After opening the Add-ons window, select the Menu Editior extension, and click Options, for editing the Context Menu. This Extension is compatible with Firefox: 1.5b1 – 2.0.0. * and can be downloaded from here.